With the spring turkey season just a mere couple of weeks away, my eyes are constantly glancing at the long range forecast. Today is no exception. Based on the 15 day forecast, the weather in west Alabama on March 15 (our opening day) will be sunny with a high of 65 and a low of 38. Even though I know it is almost guaranteed that it will be pouring as I walk out of the camp that morning, at least it is comforting to know that as of right now, the perfect turkey hunting day is projected for me. I have long held the theory that the perfect turkey hunting day was a sunny day with a high temperature around 70 and a low around 40, with the barometric pressure above 30 degrees MB. However, the unseasonably warm days we had in the 2012 season-a light jacket was required a total of two days out of 45 in Alabama-convinced me that come heat wave or blizzard, turkeys are still going to be turkeys, as we had our best season in Sahara Desert-like conditions. Cold weather is something we really do not face very much in Alabama compared to our counterparts out west or up north. The temperatures rarely fall below freezing, even during the first couple of weeks during the season. 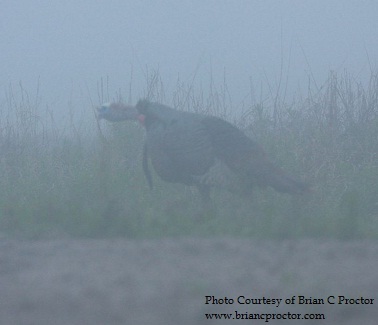 When we do have the occasional cold blast, and turkeys do not gobble as well as us hunters hope, we tend to use the phrase “the cold must have frozen up their gobble boxes!” But is this really true? For more information on Quaker Boy Calls, including their line of Turkey THUG calls, visit their website at www.quakerboy.com. For more information on Cody Turkey Calls, including their "Old School" series which features calls in Mossy Oak Original Bottomland, visit their website at www.codyturkeycalls.com.